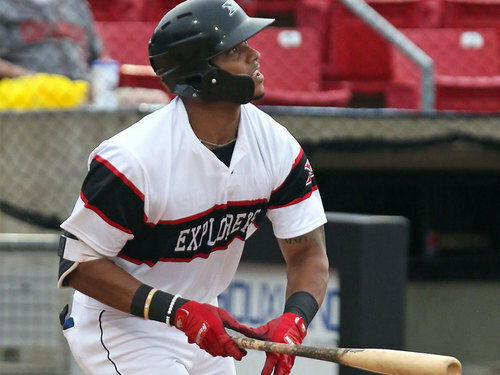 Bridgewater, NJ - The Somerset Patriots have acquired infielder and American Association Player of the Year Jose Sermo from the Sioux City Explorers for a player to be named later. He will be active for tomorrow night’s game against the Southern Maryland Blue Crabs. Sermo enters his first season with the Somerset Patriots and first in the Atlantic League. The 6’1” infielder put up career numbers earlier this season with the Explorers. There, Sermo set career highs in batting (.316), home runs (22), RBI (81), runs (75), stolen bases (24), on-base percentage (.423) and slugging percentage (.627) over just 87 games played. The Bayamon, Puerto Rico native led the American Association in RBI and slugging, was tied for second in the league in home runs, ranked fourth in walks (59) and fifth in steals. He was named to the American Association Post-Season All-Star team at the end of the year. Sermo spent the first three years of his professional career in the Milwaukee Brewers organization. He then split time between the Frontier Greys (Frontier League) and Gary SouthShore RailCats (American Association) in 2015. The 27 year-old hit .311 with Gary to begin 2016 before the Boston Red Sox purchased his contract. The switch hitter finished the 2016 season in the Red Sox organization with High-A Salem and returned to the same level in 2017. Sermo hit .250 with 14 home runs, 58 RBI and eight stolen bases over 110 games with Salem last year. The 35th-round draft pick by the Brewers in 2012 owns a .272 batting average of his seven-year career with 60 home runs, 297 RBI and 63 stolen bases.